Cape Town - Orlando Pirates midfielder Sifiso Myeni, who is now in his third season at the Soweto giants, feels that his best is still to come. Myeni spent his early years plying his trade at Bidvest Wits, where the pressure and expectation wasn't quite what it is at Pirates. The transition was always going to be a delicate one but Myeni thinks that he has finallly found his feet at the Bucaneers. Myeni played in 28 Premiership matches for the club last season and has already been given 20 starts this term. "I think I'm getting there in terms of living up to expectations," said Myeni, after his club's 2-1 against Mpumalanga Black Aces on Wednesday. "When you come from a 'smaller team' you are constantly judged, but I just have to just keep my head down, work with the team and keep doing what I'm doing," added Myeni, who has been recognised as one of the better players in the team during the 2015 section of the campaign. 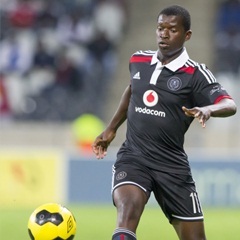 Myeni, like many in the Pirates squad, has credited coach Eric Tinkler with sparking the team's revival this year. Myeni feels that under the Tinkler regime the team has been more motivated than ever, which has helped with his personal performance. "The technical team has done well to keep the spirits high, even among the guys not playing, so credit to them for that," added Myeni. "We play every game like it's a final, so we leave everything on the field. When it's done we move on to the next."